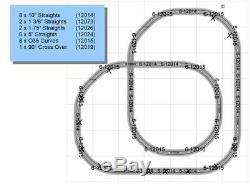 LIONEL Fastrack 40" x 60" Oval to a Corner Deluxe Layout ADD-ON-PACK Has all the track need ed to take an existing 40 x 60 Oval and turn it into a Corner Deluxe layout! 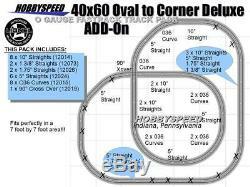 Y OU DO NEED: 40 x 60 Oval Track Pack pieces before using this Add-On. This is an ADD-ON-PACK (NOT the complete Corner Deluxe Layout) This Pack Includes. 2 x 1 3/8 Straight s (6-12073). 2 x 1.75 Straights (6-12026). 6 x 5 Straights (6-12024). 8 x 10 Straights (6-120 14). 8 x O36 Curves (6-12015). 1 x 90° Crossover (6-12019). LIONEL never issued this as a p re packaged item. Dimensions assembled (with your existing 40 x 60 Oval sections) : 85" x 85". Will run your Lionel, Kline, MTH, Weaver, MDK, or any O/O27 trains! And receive our final invoice to pay. All items must be paid within 7 days. Value Added Authorized Lionel Dealer. The item "LIONEL FASTRACK 40x60 TO A CORNER DELUXE LAYOUT ADD-ON-PACK design O GAUGE NEW" is in sale since Sunday, August 13, 2017. This item is in the category "Toys & Hobbies\Model Railroads & Trains\O Scale\Other O Scale". The seller is "hobbyspeed" and is located in Indiana, Pennsylvania. This item can be shipped worldwide.